Limited time DaddyDeal from Amazon on M*A*S*H The Complete Series and Movie. Only $69.99. Please note: This is not the “Martinis and Medicine Complete Collection,” but rather a bundle of the individual seasons and the movie. Today only and while supplies last, get all 11 seasons of the award-winning series, M*A*S*H*, as well as the movie adaptation of M*A*S*H*. Offer ends November 10, 2014 at 11:59pm PST. Emphasis added. Like the song says, if you want it, here it is, come and get it. 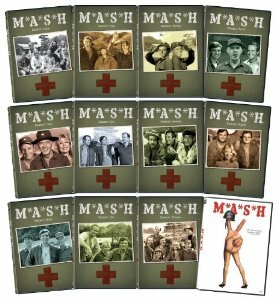 Amazon.com: M*A*S*H: The Complete Series + Movie: Movies & TV.